Ahhh the sports film. The Hollywood tradition of inspiring stories and underdog tales that are bound to excite just about anyone, regardless of your attachment to the sport itself. If Hollywood can not only show a bit of sports history along with a relevant social justice issue, then you know a director, or directors in this case, will come flocking. Lock up some award caliber leads and you may just have a quality film on your hands. The 1973 tennis match between Billie Jean King (Emma Stone) and Bobby Riggs (Steve Carell) became the most watched televised sports event of all time. Trapped in the media glare, King and Riggs were on opposites sides of a binary argument, but off-court each was fighting more personal and complex battles. With her husband urging her to fight for equal pay, the private King was also struggling to come to terms with her own sexuality, while Riggs gambled his legacy and reputation in a bid to relive the glories of his past. When it comes to true stories, even in the realm of sports, some deserve to be told more than others. 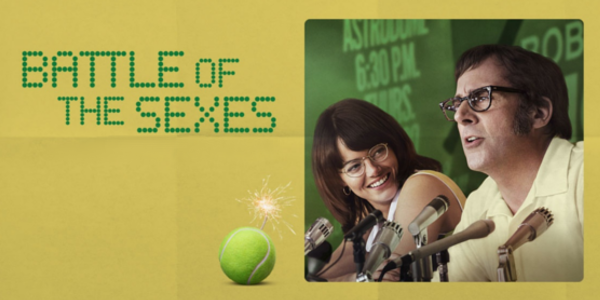 Battle of the Sexes is certainly one of those stories, and thankfully, it’s done fairly well. The film is, however, a little safe, a bit restrained and by the numbers, though the quality is without a doubt there. The intriguing insights into these two athletes lives outside of the game paints an interesting layer onto the already important match. But the lack of bite or risk prevent the film from really taking off and being more than just great. Perhaps the biggest takeaway from the film is how much two quality leads can help elevate a film. Emma Stone is fantastic actress, we know this by now, but what she does with Billy Jean King just highlights this fact even more. Though she doesn’t get to dig too deep into the famed tennis player, don’t be surprised if Stone earns another nomination this year. On the other side of the court, Steve Carell works the comedy angle with the flashy Bobby Riggs, some would say to a fault. And though the filmmakers do make Riggs a little too likeable, Carell owns every little bit of the chauvinist pig humor. Battle of the Sexes may have been the endgame for the film but the truly interesting moments fall in the smaller scenes. Throughout the rather simple premise of the film itself, the character moments all play better than the larger scope of the titular tennis match. But it’s clear the filmmakers were going for feel good film kind of tone and it shows in the film’s fluffier moments. It certainly isn’t a bad thing to have a feel-good sports film, but focusing in on the more interesting plot lines definitely would’ve made a more compelling film. Overall, Battle of the Sexes is a crowd pleasing, feel good, sports story that’s well acted across the board, but particularly from the leads. It certainly isn’t ground-breaking or anything, but it does contain some interesting parallels to current questions today regarding women, feminism, and a little touch of LGBT rights. Battle of the Sexes is not an ace of a film, but it does its job in portraying one of the more interesting sports stories out there. 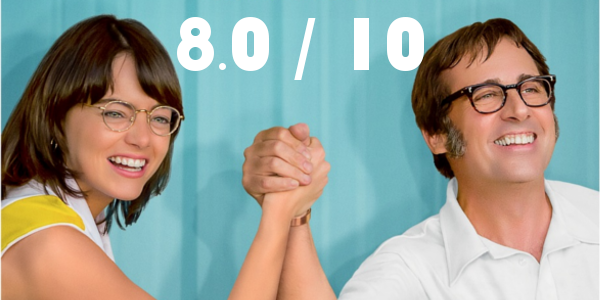 So what did you think of Battle of the Sexes? Have you seen it? Are you interested in seeing it? Subscribe, share, comment below, and as always return to I Am Sam for weekly reviews and insight.